SUBHEAD: Protesters supported by donations are not a new idea. There are national holidays for some of them. 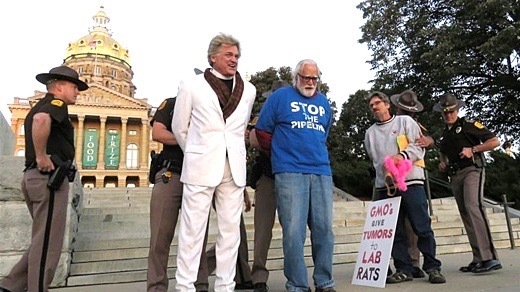 Image above: Reverend Billy getting arrested during an anti-Monsanto protest in Des Moines, Iowa in 2016. Photo by Sharon Donovan. From original article. On January 11 in Des Moines, Iowa, Reverend Billy Talen and his co-defendant, Father Frank Cordaro, were found innocent of the charge of trespass, with possible $500 fine and 30 days in prison. In her decision, Judge Carol Coppola refused to accept the prosecution's motion to stop Talen and Cordaro from invoking the First Amendment in their defence. "Your honour - he's a professional protester!" the Assistant District Attorney called out in horror. Wylie Stecklow, my long-suffering pro-bono lawyer standing next to me, cast a wry sidelong glance. Why the demonisation of protest? Protesters supported by volunteer donations are not a new idea. We create national holidays for some of the prominent ones. Sometimes, you just have to go out and ask for help! In the Church of Stop Shopping, we have 200 people who give $2 each month. We call these friends "Holy Rollers". The motion in the link above was filed for the Iowa judge to consider before our recent trial. It proposed that my co-defendant and I not be allowed to defend our actions by invoking the First Amendment, on the grounds that we have protested many times in our past and are therefore free speech abusers. Professional protester! Norman Siegel, for many years the head of the New York American Civil Liberties Union (ACLU), told us that in his experience this motion is without precedent. Retire a portion of the Constitution for a trial? Retroactively suspend a defendant's First Amendment rights? What other kind of defence strategy would a protester even consider? Monsanto's attacks on citizens that are critical of its popular herbicide, RoundUp, and its glyphosate toxin are similar to fundamentalist religions like Scientologists, Zionists, or the National Rifle Association. In contrast to their problems elsewhere in the world - where half a dozen countries have enacted prohibitions on its use and more are considering such action - in the United States, the company is successful in stifling its dissent, especially in Iowa, where newspapers accept large ad buys and the government works openly to accommodate the chemical giant. A critical researcher can be defamed publicly and dogged for years in the press and scientific journals. The recent study from Kings College's genetic researchers linking glyphosates to liver and kidney disease is the latest smoking gun, but Monsanto's spin machine will surely swing into action in the coming days. In our case, what we were all fearing was that the prosecution was protecting Monsanto. But the government's argument blew up, as it should have. The judge was not about to banish the Constitution from her court. She dismissed the charges in about two hours, which is very quick, in court time. We didn't even select a jury. The criminalisation of expressive freedoms may be a hallmark of Donald Trump's hate era. Iowa is a Trump state, as well as a Monsanto state. And Iowa is very much a Monsanto state: It absorbs more of the herbicide, RoundUp, than any other state in the union, and Iowa's cancer rates are said to be high. Iowa Governor Terry Branstad endorsed Trump, and now will be the new ambassador to China. Monsanto will like that. The World Food Prize party, where we were protesting - local wags call it "Monsanto's Oscars", has been subsidised by Iowa taxpayers up to $1m annually and features big cash awards to GMO advocates. Monsanto got Iowans to pay for their poison. The party's location says it all: They rent the entire Iowa State Capitol building. This is certain: Our nation's pro-business bias habitually places the law enforcement community in opposition to the US Constitution's protection of free speech. When the national emotion is fear, then all free speech is suspicious, and, for the corporations, free speech is a baffling gift economy. Free speech is just that: it's free. You can't sell it, therefore it must be illegal. When the official emotion is fear, then protesters symbolise the part of life that makes change. In evolution, adaptation is made possible by the arrival of mutation, of free radicals that come in the wind and the waves and upset the host organism. You must have resistance in a healthy democracy, but the resistance will change you. The Iowa prosecutor, after thoroughly losing this case, made a final speech about "respecting our police". The implication was that the people in the room who defend the First Amendment are disrespectful to the state troopers. Well, respect for the Constitution and respect for our police should never be in conflict. These police handcuffed us a football field away from the state capitol's front door. They need to look again at those five freedoms: Worship, Speech, Press, Peaceable Assembly and Redress of Grievances. The First Amendment, born in 1791, makes remarkably modern instruction. We left the courtroom knowing that there is much to be done. We are given the responsibility for this double teaching. Free speech and organic farming have common ground. They are both nature. They are wild and alive. The words and the seeds give so much, if we let them grow freely.